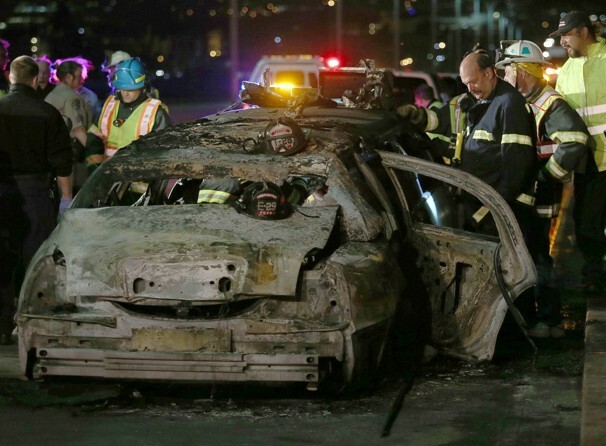 A White Limousine while carrying 9 women for a party occasion including one newly wed bride caught fire on a San Francisco Bay bridge and within 3 minutesof fire, claimed 5 lives. Relatives told local newspapers that one of the dead was Neriza Fojas, a 31-year-old registered nurse from Fresno, Calif., who recently wed and was planning to travel to her native Philippines to hold another ceremony before family. Her friends in the limousine were fellow nurses. "To watch this long limousine just engulf in flames. It was just a nightmare," Ricky Brown, the driver of that vehicle, told CNN's Brooke Baldwin on Monday. He was uninjured. He said the vehicle was doing alright and did not show any signs of fault before. Recalling the sequence of events, he said one of the women in the limousine knocked on the partition separating him from the passengers, and said "smoke." He thought she was asking if she could smoke a cigarette. "I said, 'Well, we only have four more minutes and, you know, the boss doesn't allow us to smoke in the limo.' About 30 seconds pass, and she knocks again," Brown said. This time he knew something was wrong. Smelling the smoke after that, the driver pulled over the Limo. After that he recalls, one of the women jumped through the partition and another broke open the rear door through which couple of women came out. As soon as after that the Limo burst into flames. "Everything happened so fast", he recalls and wished something more could have been done.